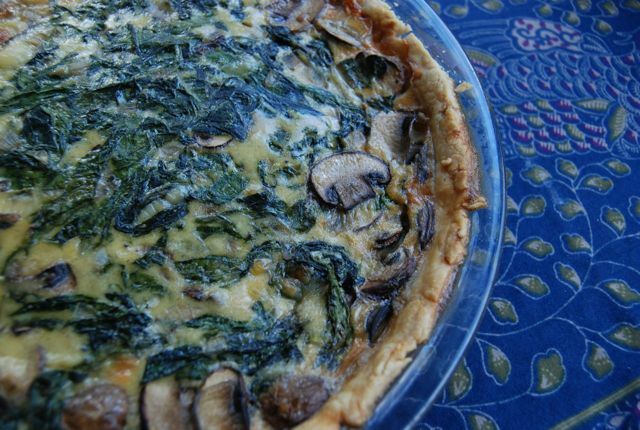 I have been making and enjoying this quiche for years. So many, in fact – I’ve lost count. Fortunately, it was easily “translatable” to salt-free living – and it still gets rave results. Feel free to alter the ingredients to suit your taste, table or pantry. I always make the mushroom, onion and spinach variety, but the recipe works equally well with low sodium bacon, broccoli, even JALAPENOS. MMmmMmmmm. The possibilities are ENDLESS. Yields one 9-inch quiche. Serves 8. Preheat oven to 350 degrees. Get out a 9-inch pie plate and set aside. To make the crust, measure the flour into a small mixing bowl. Add the vegetable shortening and cut it into the flour using a pastry blender or your fingertips. Once you’ve achieved a crumb consistency, add the water – 1/2 tablespoon at a time – and using your hands, begin gathering the dough into a solid ball. Once the dough has massed, place it onto a lightly floured surface and gently roll out into a circle, roughly 1/4-inch thick. CAREFULLY transfer the crust to the pan, pressing in and patching as necessary. Trim off excess dough, and cut or crimp edge as desired. Set aside. To make the filling. Measure the oil into a large skillet or saute pan and place over medium-high heat. Add the onion and saute for several minutes. Add mushrooms and spinach and continue cooking until the onion is translucent, spinach is wilted and mushrooms begin to release their juice. Drain well and set aside. Break the eggs into a large mixing bowl and whisk well. Add the milk, mayo, flour and freshly ground black pepper to taste. Blend well. Finally, add the cheese, along with the contents of the saute pan, and stir to combine. Pour the filling into the prepared crust. Place pan on middle rack in oven and bake 45-50 minutes, until set. Remove from oven and place on wire rack to cool. Cool at least slightly before serving. Serve warm or cool. *NOTE: Fresh large leaf spinach works equally well in this recipe. If using regular large leaf spinach, remove tough stems, wash well, and coarsely chop before cooking. Add spinach with mushrooms during saute step and cook until wilted. Remember to drain well! Pingback: The Daily Dish » Blog Archive » Christmas Eve is Here. Going to make the Super Easy Quiche tomorrow as it looks and sounds delicious. A question? Can I freeze it? Hey Sharon – Terrific!! Really hope you enjoy it. As for freezing, not sure b/c I’ve never done it. Having dealt w/ other pies in the past (like pumpkin, etc.) I’d hazard a guess that the filling may separate away from the crust. Not a big problem if you’re just consuming it yourself and could care less about aesthetics. The bigger question to me is the effect on the texture and consistency of the egg. I’m truly sorry I can’t offer experience. Please let me know how it goes if you do try. Best wishes! A quick note: This quiche can be made without the crust and will be every bit as tasty! So when pressed for time (or if you want to limit fat), simply omit it. I’ve made it sooo many times, both ways, and it’s always amazing. It was very good, the only think I will do different next time is add a little garlic and Mrs Dash to the spinach. Great idea, Patti! Glad you enjoyed it.